Mike has never been an avid traveler. It’s not that he doesn’t enjoy himself when he goes on vacation, but in getting to that point he 1. has to take time off of work – something he’s pretty terrible at doing, unless it’s taking time off work to go work another gig (something that’s encouraged in his field), and 2. plan way ahead/spend money, two things he definitely doesn’t love doing. Knowing this going into our marriage, I made it a priority that we’d go on at least one vacation a year. Each year, I’ll plan it and since Mike prefers to drive his vehicle (not fly and obtain a rental car) it’s pretty easy to keep the money spending to a minimum. It was pretty easy to hash out the guidelines for trip planning. While I do love a good European vacation, that will be a treat every several years instead of annually. Instead, we’ve decided to focus on seeing the states, all of the states. Driving to the 48 contiguous ones. And popping up into Canada every so often to visit with my Aunt/Uncle/Cousin and see more of what’s got to be one of the most overlooked country by Americans, that is in-fact totally worth visiting and exploring. 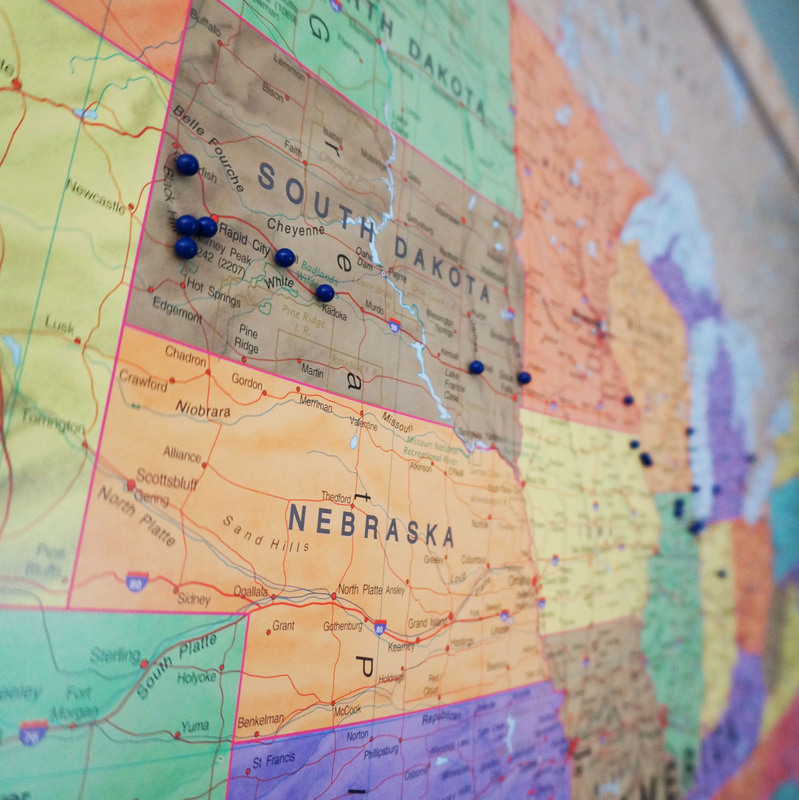 So far, we’ve ticked 9 states off of the list with 2 more getting checked off later this summer (we’ve actually been to more individually, but the official tally is a ‘we’ thing). 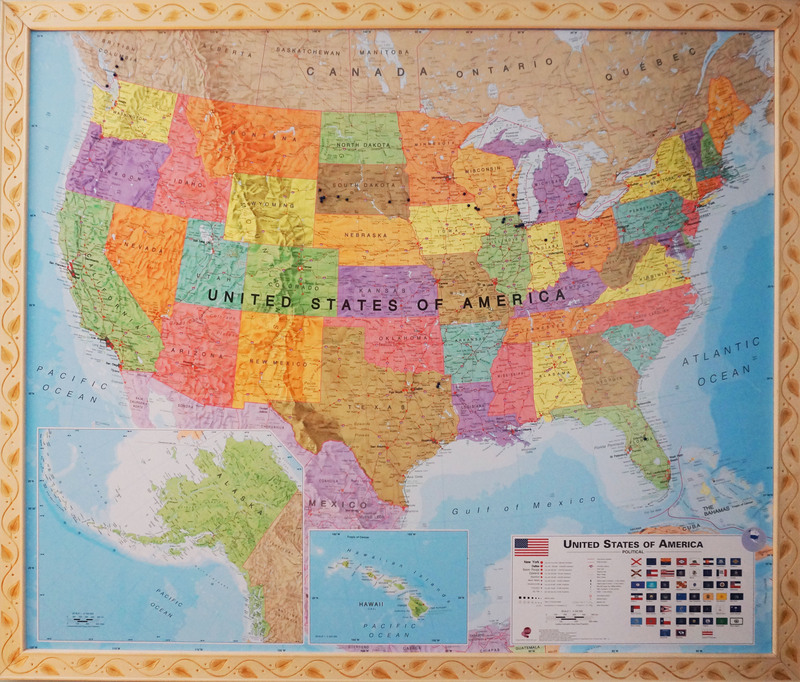 In order to commemorate each of our adventures, both big and small, we purchased a large ‘school-style’ map of the United States that includes a sizable amount of Canada (bonus!). Since Mike’s busy finishing up the second in-house studio for Studio255 and preparing to start work on the new deck, the task of finding/purchasing/hanging the map and pins fell onto my project list. My initial plan was to buy cork squares, nail them into the wall (the adhesive that comes on the back isn’t rated well at all) and pin the map to the cork. I found a few flaws in that plan. Mainly that doing it this way would make the map a permanent fixture on our bedroom wall, if we ever wanted to re-paint the room or move the map to another wall or place in our house, we’d have to take out all of the ‘places we’ve been’ pins, separate the map from the cork, separate the cork from the wall, and try to put the whole thing back together. I also figured that if the map was just pinned onto the cork, it might sag overtime and would be more susceptible to suffering the wear and tear of having exposed edges. I evolved my plan to include mounting the cork onto a thin sheet of wood and using spray adhesive to stick the map to the cork, and then screwing the whole thing into the wall. Then I decided that I should probably make a frame to keep the whole thing from looking jenky. There I ran into the problems of weight, thin wood bowing, and the potential of wanting to move the map down the line – would taking the screws out rip the paper? It wasn’t until I roped my Dad into the project that it got its sea legs. He replaced the thin wood and cork with lightweight foam core, solving both the weight and bowing problems in one fell swoop. At Home Depot we found some lightweight decorative molding to use as the frame (instead of the crown molding I was initially envisioning) and my brother used his building expertise to show us how to best sandwich the whole thing together. My Dad and I decided to assemble the map/frame on Sunday at my parent’s house before I was to attend a matinee performance of Evita with my in-laws. My usual 1-2 hour morning napper decided to sleep for 2.5 hours, which threw off our departure time. While my Dad waited for Luke and I to get to his house, he decided to use the spray adhesive that we bought to make the double thick foam core base. When we arrived at my parent’s house, I deposited Luke with my Mom before helping my Dad carefully adhere the map to the foam core. After using a rolling pin to smooth out the bubbles, my involvement was pretty much done. See, we were waiting for my brother to volunteer to help out with the cutting of the wood… and that took a while. In fact, it still hadn’t happened at the point when I needed to leave for the show. 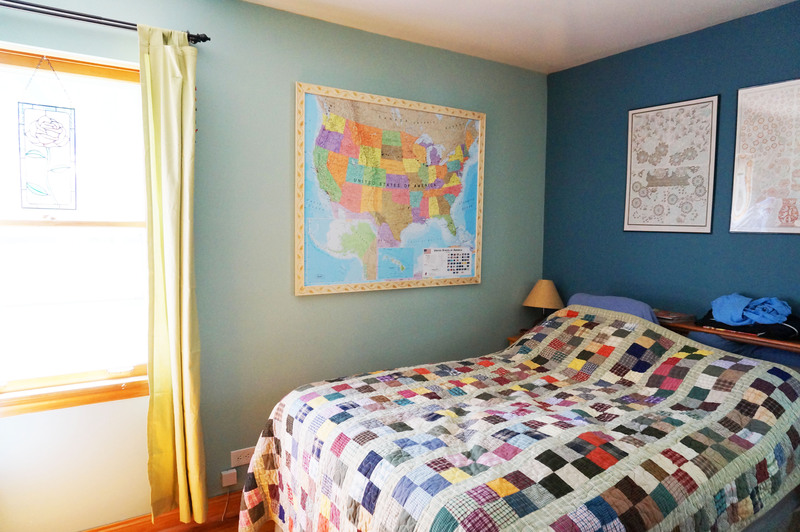 When I got back to my parent’s house that night after the show and a birthday dinner for Mike’s grandmother, I was pleasantly surprised that my Dad had happily finished the framing of the map. After clipping a few long nails on Monday, he triumphantly walked the map over to my house (it was too big for the car). Later Monday evening, when I had a quiet half hour, I happily added pins to the map, looking up specific places where we’ve stopped along the way and wondering where 2015’s adventure will take us and what it will be like to plan a vacation around the energy-level/attention span/tastes of an 18-month old. Note: The Badlands and Toronto have not yet been pinned since I ordered some pin flags to mark significant yearly trip destinations – they haven’t come in the mail yet, so I’m not sure if I’m going to actually like/use them or not. Another Note: If you’d like to purchase this map for yourself, it’s 47″ wide and 39″ tall and you can purchase it from AllPosters.com (link here). This blog entry is in no way sponsored by or affiliated with AllPosters.com. While I was working on the kitchen yesterday, I noticed the wrapper to the shower curtain that we registered for (and didn’t think about when we were picking paint colors). Orange and brown might not have been the first colors I’d think to put together, and with just the shower curtain and the wall paint in the bathroom, it’s not my favorite combination – but there is definitely potential for greatness once the right accessories are added. The first accessory that I started to seek out were cabinet knobs. When hand-painted knobs that fit my budget weren’t showing up, I realized that I can just purchase cheap, unfinished wooden knobs and paint them myself using the leftover paint from the bathroom walls! Perhaps with the right brush I can even bring the dandelion motif from the shower curtain onto the little knobs. Once I realized that I can DIY a lot of home accessories (sometimes I forget just how crafty I am), I decided that perhaps some potted plants on the wide bathroom windowsill would look nice – and offer up another opportunity to pull everything together. Perhaps I’ll paint the flower pots brown and bring over that same dandelion motif. Other areas that I might be able to paint myself could be a tissue box cover and the Dixie Cup holder. Thankfully the wooden bathmat that we registered for should look nice with the overall look and our nice towels are a neutral gray. I’ll post pictures as I make progress, but at least now I have a plan.